Our Recovery Ecology scientists are currently working with two species, the Stephens’ kangaroo rat and the San Bernardino kangaroo rat. The survival of both species is threatened by habitat loss and fragmentation. Much of the forb grassland and alluvial scrub habitats that Stephens’ and San Bernardino kangaroo rats need to survive has been developed into agricultural, urban, and suburban areas. Stephens’ kangaroo rat populations now persist primarily on reserves and other protected areas. The situation for the San Bernardino kangaroo rat is even more dire, with only a few isolated populations remaining. Our Conservation Genetics team is conducting range-wide studies for both species to examine isolation between populations and assess their viability. A low degree of connectivity could mean that individuals are unable to find mates and move safely between habitat areas. Kangaroo rats play an important in the ecological communities in which they live. Specifically, they influence plant growth by feeding on and dispersing seeds and digging burrows in the soil. This contributes to the overall health of their ecosystem. They are also prey for numerous predators, including barn owls, burrowing owls, snakes, and coyotes. 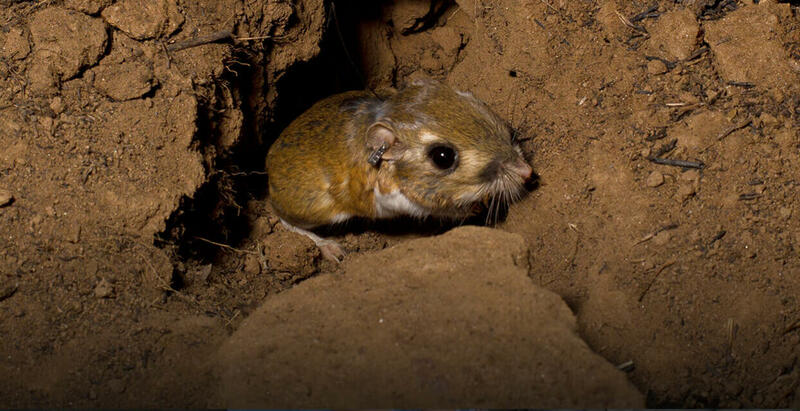 In order to help keep ecosystems healthy, we have worked with our partners to translocate kangaroo rats out of areas that are slated for development and into appropriate habitat on protected reserves. Kangaroo rats are most active at night and are known to adjust their behavior to the phase of the moon; they are the least active during the full moon and more active under less moonlight. The amount of light in their environment has a direct impact on how easily they are detected by predators when they are out of their burrows. The degree to which extra light at night coming from artificial human sources affects kangaroo rat behavior, survival, and persistence is unknown. We are conducting studies to examine how light from artificial sources affects foraging behavior of kangaroo rats. If kangaroo rats are less likely to forage where artificial light is present, this could decrease the amount of food they are able to collect. These food stores are critical to allowing kangaroo rats to survive periods of low food availability, such as droughts.